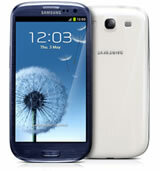 The Samsung Galaxy S III is the third incarnation of the popular Android powered phone. A top spec, HD screen and blistering pace make it perfect for watching TV and movies. The Samsung Galaxy S3 is easily the number one smarpthone out there at time of writing. It has all the features you would expect and need, with great battery life, amazing large screen and super fast processor, its a winner. The new Samsung Galaxy S3 has been released as an iphone beater, and with its design,features and price,some people claim its the best phone out there.But is it? The Galaxy S3 is a stunning looking phone, it comes in a color choice of Marble White or Pebble blue. It is without doubt a very large phone with the standout 4.8 inch Super Amoled HD screen. Its dimensions are 136.6 x 70.6 x8.6mm and it is a very lightweight phone at 133g.The build is of plastic, and it shows. Samsung have added a Smart Voice into the phone,which is pretty much like siri on the IPhone. It can start appointments,sets alarms and start and stop music playing. Its also good for sending texts,and finding out things from the internet like information and the weather forecast. The camera is 8MP and has the usual flash option and different settings on the camera shots,for example Single Shot Outdoor Shot Smile Shot and HDR. With the Google Play Store,there are millions of TV and video apps as well as games to find.The movie and TV shows apps are aplenty, with Nefilx, Hulu and Youtube all running fast and smoothly. And games like Dead Space used with the phones huge sceern look perfect. This phone is at time of writing probably the best looking and most feature packed smartphone on the market With it's slick and appealing features all running on a blisteringly fast Android operating system. The screen is so large which makes the phone not so handsized,its still a great phone to have with all of the features. It is perfect for anyone especially those that want to take advantage of the big scren. Movies and TV shows look great, as do games and apps. The top phone of the moment.